NOTE: Any bonus tracks and/or remixes are counted within their respective album's range. G5: "You Can't Judge a Book by the Cover"
Reason: Screamed; poor tone & unrepresentative of her voice. F5: "Jane, the Insane Dog Lady"
E5: "Blues for Breakfast", "Cherries Jubilee", "I Can't Wait", "It's Getting Better"
D5: "I Call Your Name", "I Can Dream, Can't I? ", "Move In a Little Closer, Baby", "My Girl", "Nora's Dove", "No Salt on Her Tail", "Searching", "String Man", "Walk to the Point", "What Was I Thinking of"
C♯5: "Act Naturally" live with Johnny Cash, "Blues for Breakfast", "Dancing in the Street", "Even If I Could", "Every Body's Been Talkin'", "Free Advice", "Glad to Be Unhappy", "Glory Glory", "I Am Now", "I'll Be Home", "Jane, the Insane Dog Lady", "Make Your Own Kind Of Music/New World Coming/Dream A Little Dream Medley" live - Don't Call Me Mama Anymore, "New World Coming", "On and on", "Searching", "Straight Shooter", "Too Much Truth, Too Much Love", "Trip, Stumble and Fall", "Walk to the Point", "Welcome to the World", "Wild Women", "You Know Who I Am"
C5: "The Banjo Song", "Burn Your Hatred", "Cherries Jubilee", "Disney Girls", "Does Anybody Love You", "Don't Call Me Mama Anymore" live - Don't Call Me Mama Anymore, "European Blueboy", "Glad to Be Unhappy", "Glittering Façade", "Hey Girl", "I Can't Wait", "I Shall Be Released" live with Joni Mitchell & Mary Travers, "The 'In' Crowd", "Jesus Was a Cross-Maker", "Make Your Own Kind Of Music/New World Coming/Dream A Little Dream Medley" live - Don't Call Me Mama Anymore, "Move in a Little Closer, Baby", "My Heart Stood Still", "No Salt on Her Tail", "Once Was a Time I Thought", "Safe in My Garden", "Sing for Your Supper", "Too Much Truth, Too Much Love", "The Torch Song Medley" live - Don't Call Me Mama Anymore, "Twelve Thirty (Young Girls Are Coming to the Canyon)", "What Was I Thinking of", "Winken, Blinken and Nod", "Words of Love"
B4: "The Banjo Song", "Blueberries for Breakfast", "Cherries Jubilee", "Come Along", "Dancing Bear", "Dancing in the Street", "Different", "Don't Let the Good Life Pass You By", "Do You Wanna Dance", "Everybody's Been Talkin'", "Glory Glory", "Grasshopper", "I Call Your Name", "If You're Gonna Break Another Heart", "For the Love of Ivy", "Here We Go Again", "Ho Honey Ho", "I Am Now", "I'll Be There", "It's Getting Better", "Listen to the Word" live - Don't Call Me Mama Anymore, "Make Your Own Kind of Music", "Monday, Monday", "New World Coming", "Next to You", "Nora's Dove", "Pleasing You", "Rider", "Rubber Band", "Sistowbell Lane", "Something to Make You Happy", "A Song That Never Comes", "Sweet Believer", "That Kind of Girl", "That Song", "Too Late", "The Torch Song Medley" live - Don't Call Me Mama Anymore, "Trip, Stumble and Fall", "Twist and Shout", "Walk Beside Me", "Walk to the Point", "When I Just Wear My Smile", "When It Doesn't Work Out", "Words of Love", "You Know Who I Am"
B♭4: "The Costume Ball", "Different", "European Blueboy", "Country Medley" live with Johnny Cash - The Johnny Cash Show, "Does Anybody Love You", "Go Where You Wanna Go", "Got a Feelin'", "Here We Go Again", "I Think It's Going to Rain Today", "I'll Be Home", "I'll Be Seeing You" live - Don't Call Me Mama Anymore, "The 'In' Crowd", "Long Time Loving You", "Move in a Little Closer, Baby", "My Love" live - Don't Call Me Mama Anymore', "Oh Babe, What Would You Say? ", "On and on", "People Like Us", "Saturday Suit", "Say Hello", "Softly and Tenderly" live 1969 - The Johnny Cash Show, "Somebody Groovy", "A Song That Never Comes", "To Be Free", "Twelve Thirty", "When It Doesn't Work Out", "You Baby", "You Can't Judge a Book by the Cover"
A4: "All for Me", "Blues for Breakfast", "Burn Your Hatred", "California Dreamin'", "California Earthquake", "Cherries Jubilee", "The Costume Ball", "Creeque Alley", "Darlin' Companion" live with John Sebastian, "Darling Be Home Soon", "Dedicated to the One I Love", "Disney Girls", "Don't Let the Good Life Pass You By", "Do You Know What I Mean", "Dream a Little Dream of Me", "For the Love of Ivy", "Glittering Façade", "Grasshopper", "He's a Runner", "I Am Now", "I Can Dream, Can't I? ", "If You're Gonna Break Another Heart", "I'll Remember Tonight", "I May Be Right", "It's All in the Game", "It's Getting Better", "Jesus Was a Cross-Maker", "Lady Luck", "Love Was Not a Word", "Mansions", "Midnight Voyage", "My Girl", "My Heart Stood Still", "Next to You", "No Dough", "People Like Us", "Pleasing You", "The Road Is No Place for a Lady", "The Room Nobody Lives in", "Sing for Your Supper", "Sit and Wonder", "So Fine", "Something to Make You Happy", "Sour Grapes", "Straight Shooter", "String Man", "Theme from 'L'Amour'", "To Be Free", "Try It, Baby", "You Know Who I Am"
A3: "All for Me", "Blues for Breakfast", "California Dreamin'", "California Earthquake", "Come Along", "Dark As a Dungeon", "Don't Let the Good Life Pass You By", "Dream a Little Dream of Me", "Everybody's Been Talkin'", "Glittering Façade", "I Call Your Name", "If You're Gonna Break Another Heart", "The 'In' Crowd", "Lady Luck", "Leaving on a Jet Plane" live 1972 with John Denver, "Make Your Own Kind of Music", "No Dough", "Once Was a Time I Thought", "Rubber Band", "Say Hello", "Silkie", "Sit and Wonder", "Sour Grapes", "That Song", "Tony & Delia", "Walk Beside Me"
G♯3: "Country Medley" live with Johnny Cash - The Johnny Cash Show, "Darlin' Companion" live with John Sebastian, "Different", "Easy Come, Easy Go", "Got a Feelin'", "I Am Now", "I Can't Wait", "I Don't Wanna Know", "I May Be Right", "It Makes a Long Time Man Feel Bad", "Look Through My Window", "People Like Us", "Midnight Voyage", "When I Just Wear My Smile"
G3: "All the Pretty Little Horses", "Blow Me a Kiss", "Blues for Breakfast", "Country Medley" live with Johnny Cash - The Johnny Cash Show, "The Costume Ball", "Dark As a Dungeon", "Dedicated to the One I Love", "Different", "Disney Girls", "Don't Let the Good Life Pass You By", "Do You Know What I Mean", "I Think It's Going to Rain Today", "Jesus Was a Cross-Maker", "Leaving on a Jet Plane" live 1972 with John Denver, "Love Was Not a Word", "Move In a Little Closer, Baby", "My Heart Stood Still", "Oh Babe, What Would You Say? ", "The Road Is No Place for a Lady", "The Room Nobody Lives in", "Say Hello", "Sing for Your Supper", "Softly and Tenderly" live 1969 - The Johnny Cash Show, "Something to Make You Happy", "Try It, Baby", "We'll See", "What Was I Thinking of", "Who's to Blame"
F♯3: "Ain't Nobody Else Like You", "Anna Fia (Feher)", "Baby I'm Yours", "Didn't Want to Do It", "Don't Make Me a Memory" live - Don't Call Me Mama Anymore, "Down in the Valley", "Dream a Little Dream of Me", "The Good Times Are Coming", "Glory Glory", "Here We Go Again", "I Am Now", "I'll Be Seeing You/Don't Call Me Mama Anymore" live - Don't Call Me Mama Anymore, "I'll Be There", "It's Getting Better", "It Makes a Long Time Man Feel Bad", "Midnight Voyage", "One Way Ticket", "Ringo", "Rubber Band", "Sistowbell Lane", "When It Doesn't Work Out", "Young Girl's Lament"
F3: "Burn Your Hatred", "The Costume Ball", "Darling Be Home Soon", "Didn't Want to Do It", "Did You Ever Want to Cry", "He's a Runner", "It's All in the Game", "I Don't Wanna Know", "It's Getting Better", "Long Time Loving You", "Love Was Not a Word", "My Love" live - Don't Call Me Mama Anymore, "Oh Babe, What Would You Say? ", "The Road Is No Place for a Lady", "The Room Nobody Lives in", "Saturday Suit", "Softly and Tenderly" live 1969 - The Johnny Cash Show, "Sweet Believer", "Talkin' to Your Toothbrush", "What Was I Thinking of", "When I Just Wear My Smile", "Wild Women"
E3: "Ain't Nobody Else Like You", "Anna Fia (Feher)", "Burn Your Hatred", "California Earthquake", "The Costume Ball", "Don't Make Me a Memory" live - Don't Call Me Mama Anymore, "East of the Sun (And West of the Moon)", "Glory Glory", "The Good Times Are Coming", "Here It Is, Another Day", "I Can Dream, Can't I? ", "I'll Be Seeing You/Don't Call Me Mama Anymore" live - Don't Call Me Mama Anymore, "Jane, the Insane Dog Lady", "Make Your Own Kind of Music/New World Coming/Dream a Little Dream Medley" live - Don't Call Me Mama Anymore, "My Love" live - Don't Call Me Mama Anymore, "New World Coming", "Straight Shooter", "The Torch Song Medley" live - Don't Call Me Mama Anymore, "You Know Who I Am"
E♭3: "Baby I'm Yours", "Did You Ever Want to Cry", "Saturday Suit", "Welcome to the World"
Bold marks particularly impressive vocal moments. 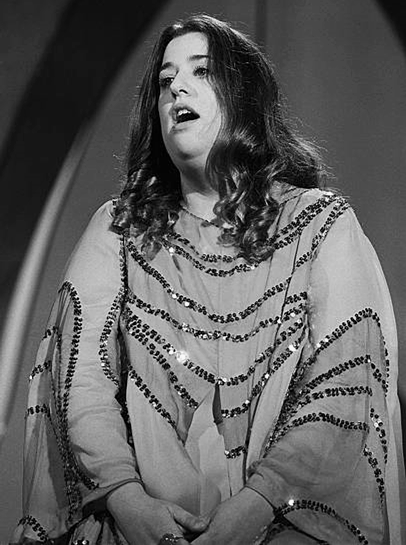 Best known as 1/4 of The Mamas & the Papas, the vocalist who arguably defined the group's sound, Cass Elliot became one of the defining vocalists of the 1960s. She possessed solid power throughout her entire range and could pull off impressive low notes and belting, even though she was most comfortable in the fourth octave. Her real strength came from the amount of personality she was able to imbue her singing with, whether it be tenderness in 'Dream a Little Dream of Me', enthusiasm in 'It's Getting Better', or world-weariness in 'Safe in My Garden'. My thanks to The Long Shot , the original thread starter in 2016, and who provided the summary which I then revised & edited. E♭5: "Hey Girl", "Midnight Voyage", "Sour Grapes"
D5: "I Call Your Name", "I Can Dream, Can't I? ", "Move In a Little Closer, Baby", "My Girl", "No Salt on Her Tail", "String Man", "What Was I Thinking Of"
C♯5: "Blues for Breakfast", "Even If I Could", "Free Advice", "I'll Be Home", "Jane, The Insane Dog Lady", "Straight Shooter", "Welcome to the World", "You Know Who I Am"
C5: "Burn Your Hatred", "Cherries Jubilee", "Disney Girls", "Hey Girl", "I Can't Wait", ""The 'In' Crowd", "Jesus Was a Cross-Maker", "Move In a Little Closer, Baby", "My Heart Stood Still", "No Salt on Her Tail", "Once Was a Time I Thought", "Safe in My Garden", "Sing for Your Supper", "What Was I Thinking Of", "Words of Love"
B4: "Cherries Jubilee", "Dancing Bear", "Do You Wanna Dance", "I Call Your Name", "For the Love of Ivy", "I'll Be There", "Make Your Own Kind of Music", "Monday, Monday", "Rubber Band", "Sweet Believer", "That Kind of Girl", "That Song", "Twist and Shout", "When I Just Wear My Smile", "When It Doesn't Work Out", "Words of Love", "You Know Who I Am"
B♭4: "Go Where You Wanna Go", "Got a Feelin'", "I Think It's Going to Rain Today", "I'll Be Home", "The 'In' Crowd", "Long Time Loving You", "Move In a Little Closer, Baby", "Somebody Groovy", "Too Late", "Twelve Thirty", "When It Doesn't Work Out", "You Baby"
A4: "Blues for Breakfast", "Burn Your Hatred", "California Dreamin'", "California Earthquake", "Cherries Jubilee", "Creeque Alley", "Dedicated to the One I Love", "Disney Girls", "Dream a Little Dream of Me", "For the Love of Ivy", "He's a Runner", "I Can Dream, Can't I? ", "It's All in the Game", "It's Getting Better", "Jesus Was a Cross-Maker", "Lady Luck", "Mansions", "Midnight Voyage", "My Girl", "My Heart Stood Still", "The Room Nobody Lives In", "Sing for Your Supper", "Sour Grapes", "Straight Shooter", "String Man", "Try It, Baby", "You Know Who I Am"
A3: "Blues for Breakfast", "California Dreamin'", "California Earthquake", "Dream a Little Dream of Me", "I Call Your Name", "The 'In' Crowd", "Lady Luck", "Make Your Own Kind of Music", "Once Was a Time I Thought", "Rubber Band", "Sour Grapes", "That Song"
G♯3: "Easy Come, Easy Go", "Got a Feelin'", "I Can't Wait", "Look Through My Window", "Midnight Voyage", "When I Just Wear My Smile"
G3: "Blow Me a Kiss", "Blues for Breakfast", "Dedicated to the One I Love", "Disney Girls", "I Think It's Going to Rain Today", "Jesus Was a Cross-Maker", "Move In a Little Closer, Baby", "My Heart Stood Still", "The Room Nobody Lives In", "Sing for Your Supper", "Try It, Baby", "We'll See", "What Was I Thinking Of", "Who's to Blame"
F♯3: "Baby I'm Yours", "Dream a Little Dream of Me", "I'll Be There", "Midnight Voyage", "Rubber Band", "When It Doesn't Work Out"
F3: "Did You Ever Want to Cry", "He's a Runner", "It's All in the Game", "It's Getting Better", "Long Time Loving You", "The Room Nobody Lives In", "Sweet Believer", "Talkin' to Your Toothbrush", "What Was I Thinking Of", "When I Just Wear My Smile"
E3: "Burn Your Hatred", "California Earthquake", "East of the Sun (And West of the Moon)", "I Can Dream, Can't I? ", "Jane, The Insane Dog Lady", "Straight Shooter", "You Know Who I Am"
E♭3: "Baby I'm Yours", "Did You Ever Want to Cry", "Welcome to the World"
D3: "Talkin' to Your Toothbrush"
*Underlines mark notes found in backing vocals/harmonies. 1/4 of The Mamas & The Papas, the female vocalist who ended up producing the group's defining sound and one of the defining singing voices of the 1960's. Possessed solid power throughout her entire range, an abnormally low one for a female singer (it is said that she was initially denied membership into the band because her voice was too low). Her real strength comes from the amount of personality she was able to imbue her singing with, whether it be tender and emotional music or more defiant songs. Remarkable vocals and stage presence. Underrated as hell.